B�tard, Georgette Is Cool. Saving Soul. Why is a Doughka? Harlem EatUp! I'd raved about B�tard and named Chef-Partner Markus Glocker's brilliant lamb two ways the dish of the year in Manhattan magazine. That heightened my dismay at a desultory dinner soon after. The masterly lamb -- a blushing rose chop sprinkled with gremolata, followed by a thrillingly savory and rustic lamb shoulder confit with roasted potatoes and fresh veggies in an ironstone pot -- had vanished. 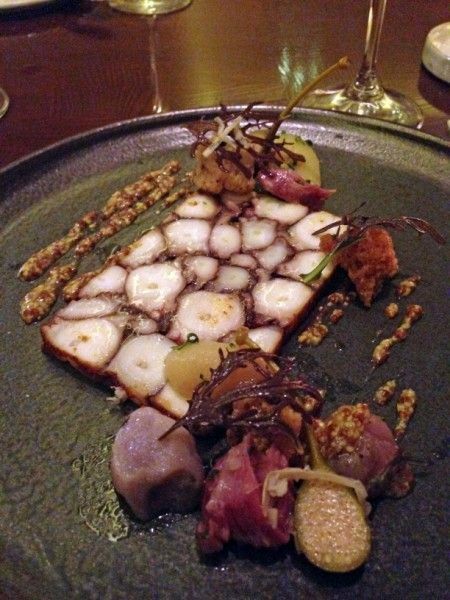 Except for the chef's signature octopus "pastrami," our choices struck me as stingy and annoyingly precious. I worried Glocker's ebullient mix of modernism and grandma's cooking had been doused by that Michelin star. Drew Nieporent was indignant, defending his newly golden toque. "Some chefs just serve the same menu over and over. That's not what Markus does. He's changing the menu every day." Well, good. I gave him credit for that. 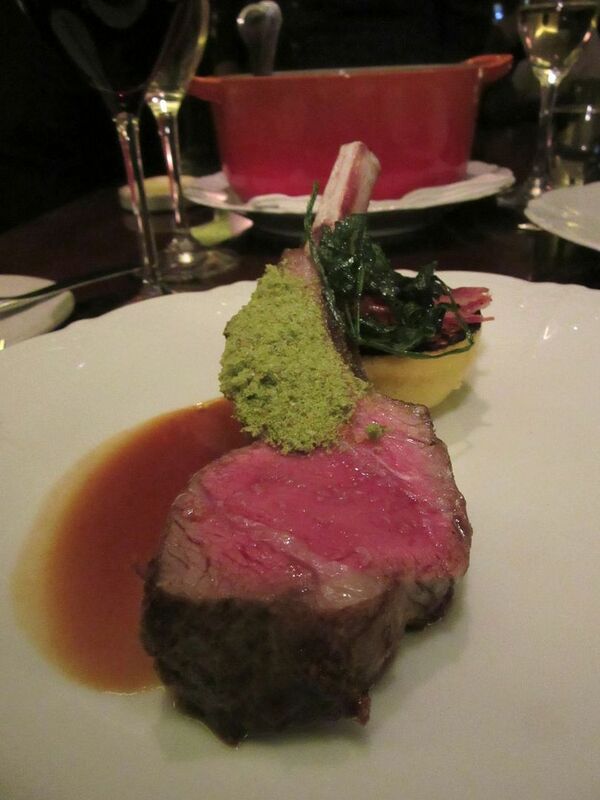 "But when chefs change the menu often, they keep one or two signature dishes," I protested. Having sent my readers to B�tard for a homey revelation (Click here to read my review), I felt I had as much as he invested in Glocker's lamb epiphany, his mother's beef Tafelspitz and the poussin schnitzel, a nightly unlisted special. "People who trust me aren't interested in eating tortured sweetbread strudel with dibs and dabs." We were both furious. I didn't know what to expect when I booked a dinner ten days ago with friends whose parents were in town from Hong Kong. Some chefs listen to me and others are unmoved. I let my friend's father have the octopus. The agnolotti were worthy of Faberg� but I'm not wild about the sweetness of sweet potato. In earlier meals, I'd swooned over Glocker's intense pea soup with salsify crumble and a ravishing distillation of summer corn. I can't say tonight's cauliflower fusion with port and charred onions afloat, matched those memories, but cauliflower is less of a natural star. Braised artichokes with barley and a poached hen's egg in a cloud of ice wine sabayon went far to restore my faith. My complaint about a stingy portion of duck breast at the birthday dinner seemed to have hit home -- the duck tonight hinted of a mother's lavish hand. 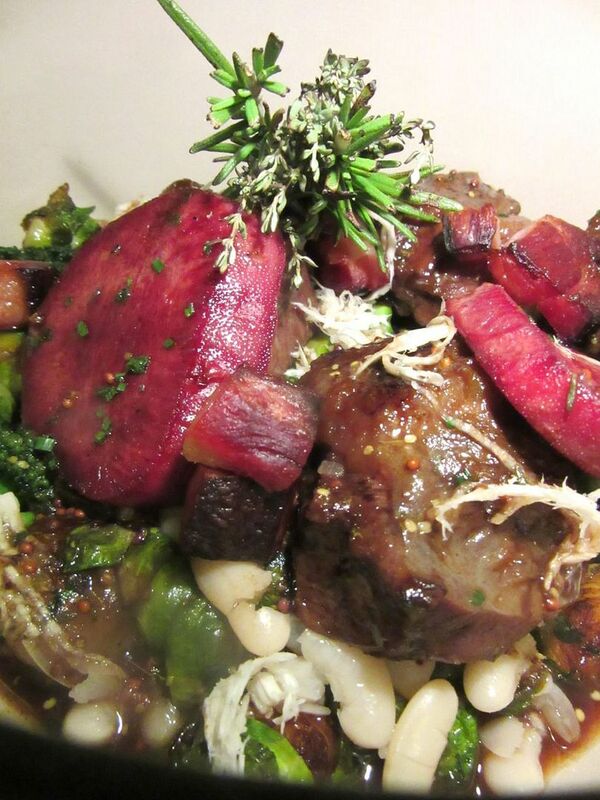 And the beef cheek pot au feu for two with its fatty meat, its slices of tongue, bacon chunks, baby Brussels sprouts, and rosemary bundle -- that alone would have melted my last doubt. 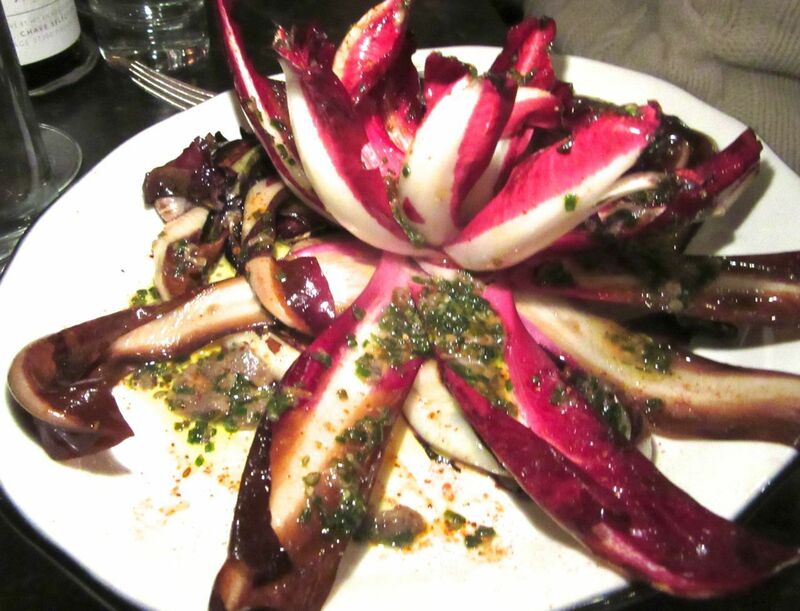 At the risk of needing to have �ber drive right up to the table, I had to order �poisses cheese with mushroom vinaigrette instead of a sweet for dessert. My companions rejected it as too pungent to share. I had no problem tasting their caramelized milk bread with brown butter ice cream. I was the only one in our group to finish a fruit gel, a dark chocolate-and-olive truffle, as well as an almond cookie. I looked for Markus to compliment him and say the pot au feu would cover for the strayed lamb or something equally embarrassing, but I couldn't find him. 239 West Broadway between Walker and White Streets. 212 299 2777. I listed Rotisserie Georgette among My Top 10 Also-Rans in 2014. My fault. I'd not been back since the earliest days, before Georgette Farkas replaced the chef, so I couldn't say anything about the food. I'd also found the woman I knew from her many years as Daniel Boulud's right hand tense and even angry as she streaked across the room on spidery high heels. It was time to return. I brought friends who'd never been. They are demanding and spoiled by decades of eating well, mostly patronizing the restaurants they love rather than pursuing the new, as I must, and our town's restless first nighters do. He called ahead to order wines. Georgette asked if she could send out a few extras. Still, I didn't expect to be overwhelmed, as we quickly were by the gifts from the kitchen. The rillette of the day was salmon. It quickly disappeared. We'd already ordered the venison p�t� en croute, but we found the two terrines that arrived unbid -- wild boar and a delicate layering of rabbit -- more compelling. There was a whole braised artichoke heart for each of us. Gone, gone, gone. 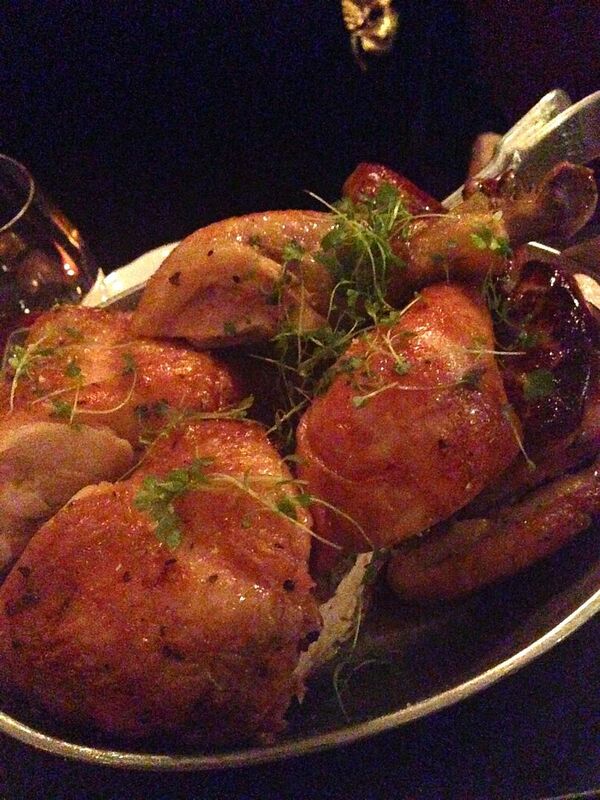 So by the time we confronted our two crisp-skinned poules du luxe for two -- stuffed with wild mushroom duxelles under the skin and with pallets of foie gras here and there -- we didn't have room for more than a small taste of our birds. Given all the sides balancing on the edge of the table -- the luscious rotisserie potatoes, the fries, roasted sweet carrots, and crisp baby sprouts -- the elevated platters of bird looked barely dented. No one was willing to share the leftovers. I refused to leave $72 worth of bird behind so I got the couturier shopping bag. ($1.75 each, Georgette boasted.) She was disappointed we'd not tried the duck � l'orange for two or the guinea hen. 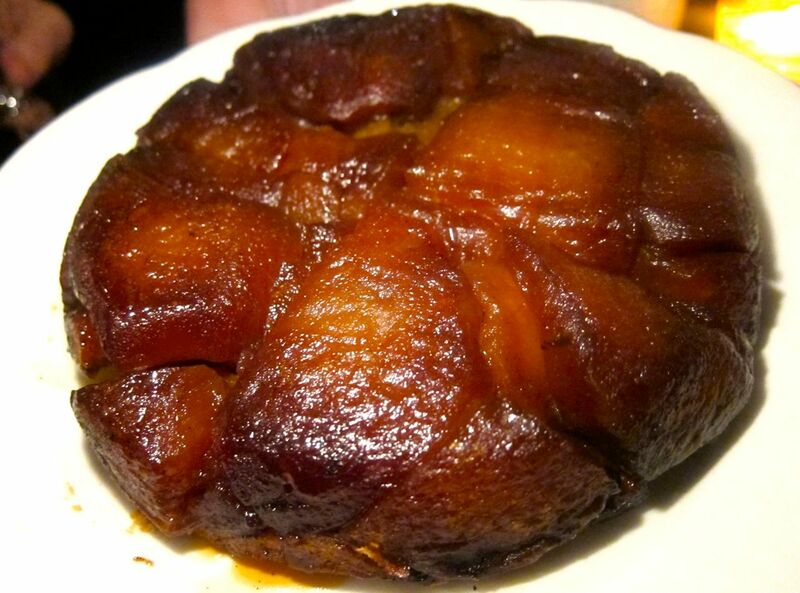 Since my friends live near by and I'd thought they might like to add Georgette's place to their small list of haunts, I insisted we had to have the signature tarte tatin. It has been exceptional on the very first day Georgette opened. A more indulgent dollop of whipped cream and cr�me fra�che tonight would leave an indelible last impression. But never mind. I'll be back with friends -- perhaps for the duck -- and I'll not hesitate to say, "more please." 14 East 60th between Fifth and Madison Avenues. 212 390 8060. 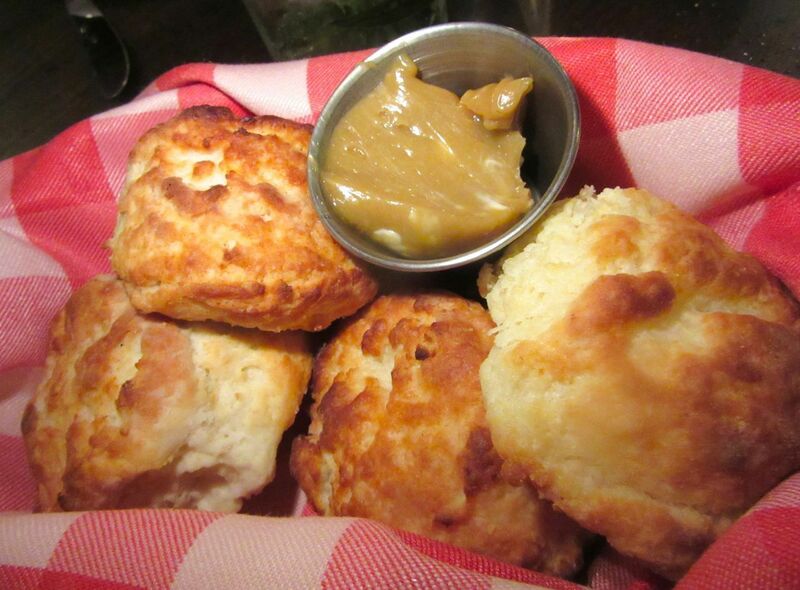 Would you rush to Harlem for an ethereal biscuit? 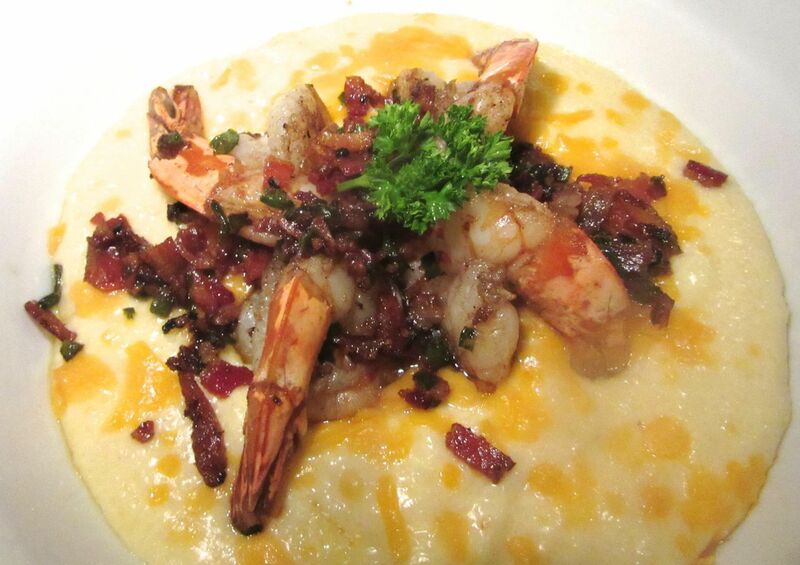 Would you hop on a train or pile into a cab for a feather-light biscuit, salty, crumbling in your fingers and maybe some shrimp and grits that will still haunt you next morning at breakfast? There's a lot of heat on Lenox Avenue, otherwise known as Malcolm X Blvd. It started eons ago with Sylvia's Soul Food of course. And the temperature soared when the downtown crowd rediscovered Marcus Samuelsson at Red Rooster with his own personal riff on soul. But my friends and I are drawn a few blocks below stardom to BLVD Bistro on the corner of 122nd Street. My driver drops me at an ice-free spot on Lenox and I follow the black wrought iron fence around the corner to the open gate, down steep steps into the snow-covered brick patio of a historic brownstone that has yet to be developed. What you see inside is all there is. Eight tables. A booth. Just 36 seats, counting three at the counter where Chef-owner Carlos Swepson, in his embroidered white tunic, is taking a breather. He dreams of franchising his BLVD Bistro concept. "Crafted American Soul." It's about using the best ingredients - pan-frying organic chicken to order, firing the macaroni on command. Using only White Lily Flour from Tennessee for the biscuits. "Taking it up a notch." 239 Malcolm X Boulevard (Lenox Avenue) on the NW corner of 122nd Street. 212 678 6200. Click here to read more so you'll know what else to order. Sundays are quiet with few interruptions. I polish my BITE for Monday and caption the photos. But obsessed as I am with staying in touch, I wander to Twitter. That's where I picked up on Grub St's ode to the Doughka, baker Fany Gerson's babka fashioned with braids of donut dough this past Sunday. Gerson, both Mexican and Jewish, says her own personal mashup inspired her. I was especially taken with the Mexican chocolate loaf, lushly speckled and stuffed with bittersweet chocolate. But I was curious too about the lemon olive oil version and eager to wrestle with the sticky-bun-pecan twist. The Grub St item said doughkas were only available on weekends and at that moment, only the chocolate. I called, identified myself as certifiably Insatiable, and asked if I could order all three and get them delivered. Gerson herself rang my bell - bubbling and excited (sorry I forgot to get out my camera.) She handed me the neat brown carton -- all three loaves, a gift, still warm from the oven. I'm not much of a doughnut fan. I've had a frosted cruller I fancied now and then, but nothing I'd obsess over for more than a day or two. There was a peanut butter and bacon flirtation in Chicago once. 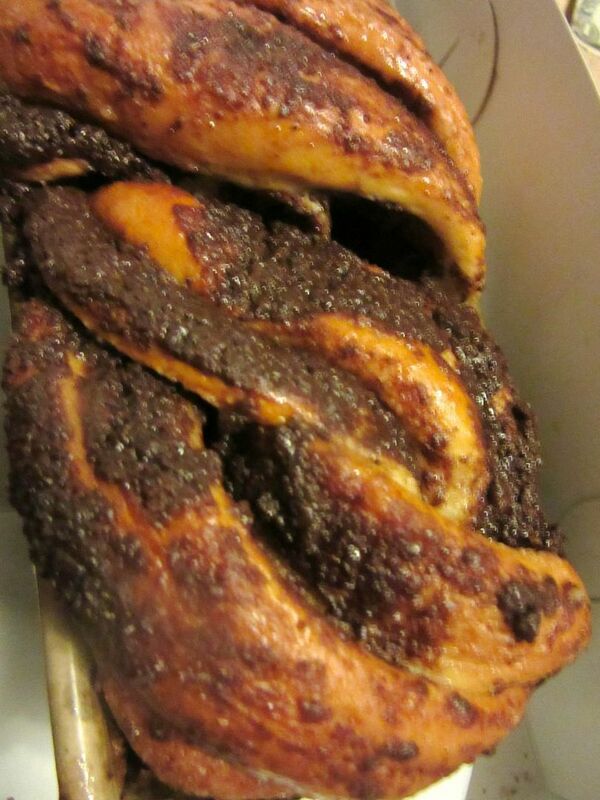 But I do have a bit of a babka habit. 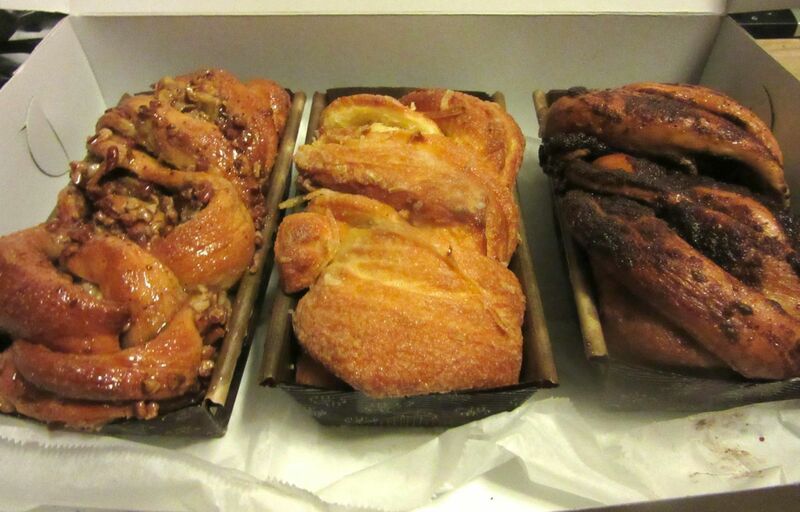 I won't say Fany's m�lange produced the most thrilling babka I've ever had, but hers were soothing (the lemon), teasing (the banana-pecan) and deliciously thought-provoking (the chocolate) with that not-too-rich cake dounuty dough. At $10 each, worth ordering now for next weekend delivery. 14 West 19th Street between 5th and 6th Avenue 212 243 6844. Also in Brooklyn. Harlem chefs link up with National Celebrity Chefs for the four-day Harlem EatUp! Festival May 14-17 - a total immersion in the food, music, art and spirit of Harlem. A roster of not-to-be-missed free and paid events has been posted. Tickets are on sale now. Friday evening's "Dine in Harlem," connects local chefs and restaurants - The Cecil, Ginny's Supper Club, Dinosaur Bar-B-Que, Jin Ramen and Vinateria with national chefs who have Harlem ties (Carla Hall, Jonathan Waxman, Sean Brock, Paul Qui and Ludo Lefebvre). In announcing the event earlier at his Red Rooster on Lenox Avenue, Marcus Samuelsson was joined by the Mayor, Harlem booster Bill Clinton, Tren'Ness Woods Black, inheritor of her grandmother Sylivia's restaurant a block north, and event co-founder Herb Karlitz. Karlitz confided that he had persuaded Frank Pellegrino to turn over you-can't-get-in-because-we're-booked Rao's for a night. Citymeals-on-Wheels and Harlem Park to Park will benefit from the festival proceeds. Photographs of B�tard's rack of lamb, octopus "pastrami," and beef cheek pot au feu, Rotisserie Georgette's poule de luxe, braised radicchio and tart tatin, BVLD Bistro's sublime biscuits and shrimp with grits, the doughka loaves, and Harlem EatUp! 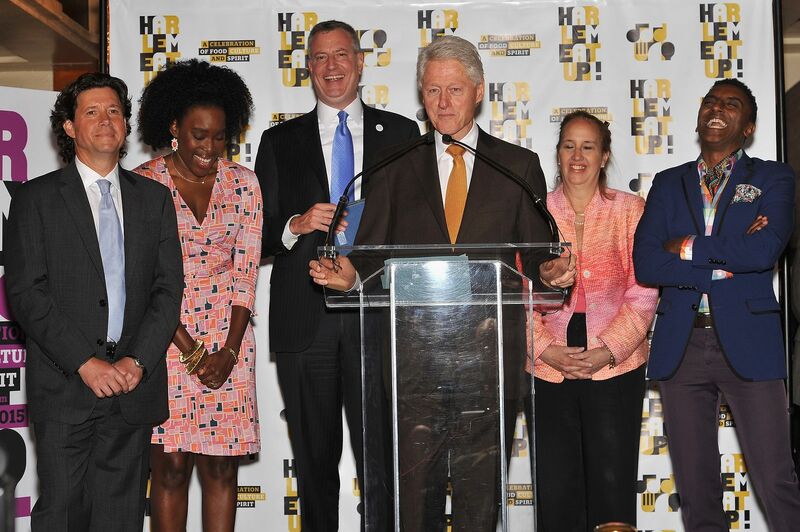 announcement photo with Herb Karlitz, Tren'ness Woods-Black, the Mayor, President Clinton, Manhattan Borough President Gale Brewer, and Marcus Samuelsson, may not be used without permission from Gael Greene. Copyright 2015. All rights reserved.